Joseph Ashe came from Somerset, the third surviving son of James Ashe Esquire, a clothier. He supported the Royalist cause and was created a baronet at the Restoration in 1660. 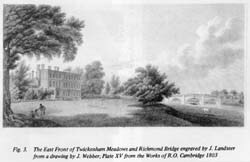 He came to Twickenham with his family in 1657, buying the property later known as Cambridge Park, from Thomas Lawley, heir of Sir Thomas Lawley (d1646). His family were to remain here for a century. He extended his land ownership in the parish and, by the time of the 1661 Survey, in addition to 59 acres adjoining the house he had acquired 134 acres elsewhere. He was active in local affairs, a churchwarden between 1659 and 1661, and a benefactor to the parish. His monument, erected in St Mary's Church, survived the collapse of the nave in 1713 and is at present on the south wall of the tower. 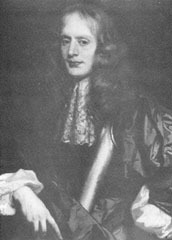 Two of his daughters made connections with Norfolk families: Katherine marrying William Wyndham of Felbrigg and Mary marrying Sir Horatio Townshend of Raynham. Their son Charles (Turnip) Townshend married, for the second time, Robert Walpole's sister Dorothy. So he became, by marriage, uncle of Horace. Joseph was succeeded in the baronetcy by James (1674-1734), when he was 12. He appears to have been a man of lesser metal than his father, being held in low estimation by his mother who regarded him as "a very feeble son". "it seems Sir James transgressed and went astray, which enraged her soe much that ever senc her last childe, which was three quarters old she never beded with him never man humbled himself more than he did to her...".